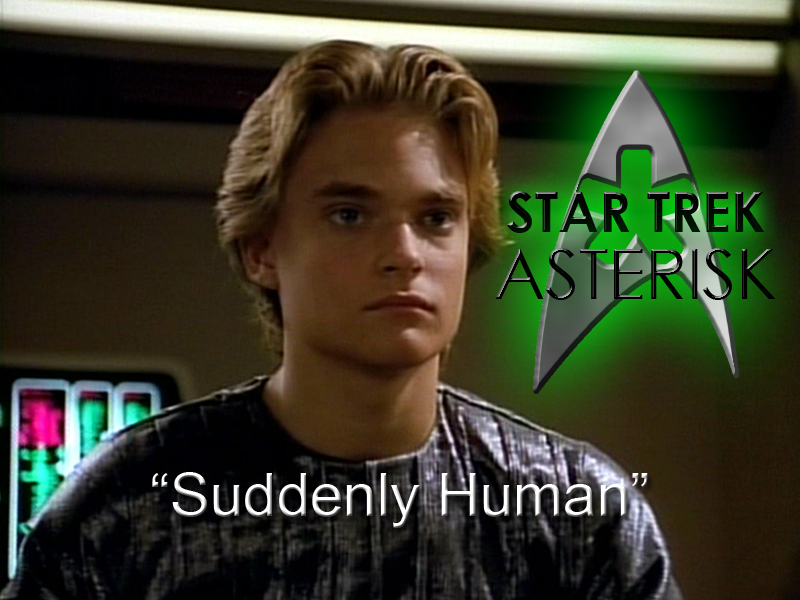 Star Trek: Asterisk "Suddenly Human"
The Enterprise finds a human boy aboard an alien craft and try to figure out who is family should be. So it starts out as a normal rescue mission. The Enterprise heads out to help a Talarian observation craft and when they beam down they find a bunch of young Talarians... and one human. It's interesting to note that the Talarians used to be enemies of the Federation. They thought the Federation was encroaching on their property, so they attacked a Federation outpost. Since then, they've made up, but it would seem that this young human, who goes by the name Jono, is actually Jeremiah Rossa. He's from the same family that was killed by a Talarian attack on their outpost. The same family that includes Admiral Connaught Rossa in its survivors. The Admiral will be very pleased to know that her grandson, the last in the Rossa line, is alive and well. In the meantime, Jeremiah insists on being called Jono and being brought back to his captain, Endar. His affection for his captain also gives him a special connection with Jean-Luc, and it's because of this connection that Beverly and Troi suggest that Picard be the one to foster a relationship with this child and help him to rediscover his human roots. See, Beverly and Troi haven't had much success speaking to Jono. Talarians don't like women, and Jono refuses to even take his gloves off in front of them, afraid to be contaminated by the touch of an alien. 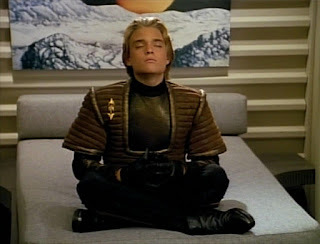 This and the evidence that Jono had, in the past, had a broken rib and other injuries also suggests to Beverly that he suffers from Stockholm Syndrome, and that whoever Captain Endar is, he must have brutalized the boy. Oh, and there's this annoying yelling thing he does to express grief. It doesn't take very long before a Talarian vessel catches up to the Enterprise and asks for their children back. But Picard is very diplomatic in enquiring about Jono. As a human, he believes he should be returned to his human family. But the Talarian, who reveals himself to be Captain Endar, is hesitant to give up Jono... you see, he's his son. While this may seem preposterous as we go into the commercial break, it's soon revealed that it's Talarian tradition to take a child from one of their conquests to replace a child they have lost to them. When Endar lead the attack on the Federation colony, he took Jono when he saw him laying beside his dead mother. Beverly still suspects that whatever their relation is, there is evidence of abuse, but Endar says, abuse? ?, that's just a boy being a boy! He hurt himself playing games with his friends. So, it's a very complicated situation made all the more complicated when Picard tries to play the father figure and Jono gets a message from Admiral Gramma. Rossa says how excited she is to see Jono and how happy she was to discover that he was alive. What's a young adopted human to do? All he's ever known was his Talarian family. Besieged by angst, Picard takes him to a racket ball game to get his mind off things. Unfortunately, it has rather the opposite effect. While they're playing, Jono gets flashbacks from the day his parents died and curls up into a mass of teenaged angst. Picard is really bad with children. After this, Picard takes him to 10-Forward hoping that'll work better than sport. They sit down with Riker and Wesley and enjoy some conversation until Jono decides to try Wesley's banana split. In the attempt to eat it, he sprays it all over Wesley's face and everyone at the table has a good laugh. Including Jono. This seems to have done the trick. While Jono and Wesley order another banana split, and Data considers the meaning of "slapstick," Picard and Riker go over to the bar to discuss how far along Jono has come, and how well Picard has overcome his awkwardness around children for him. As it would turn out, however, Jono hasn't come that far along. Because, in the middle of the night, Jono enters Picard's room and stabs Picard in the chest. It's okay! Don't worry! Beverly helps him recover quickly and he survives. But that still leaves a lot of questions. Picard asks Jono why he did it, and Jono says it doesn't matter why; all that matters is that he is punished by death. This kid wants to die rather than choose between his Talarian father and his Human roots. 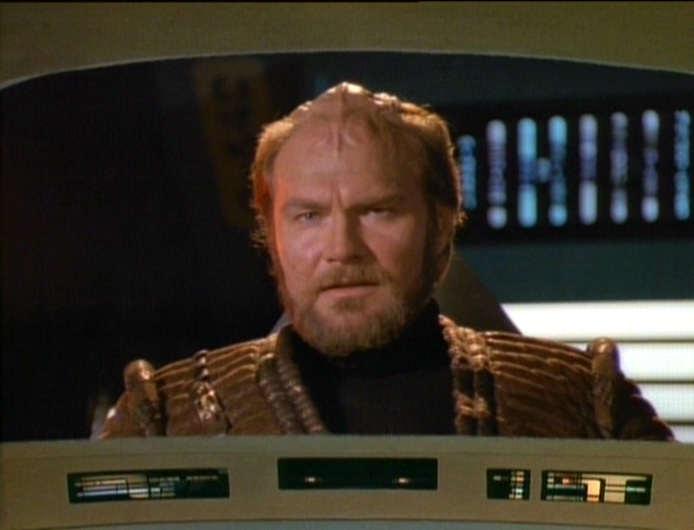 Meanwhile, on the bridge, Riker is trying to negotiate with Endar. But Endar doesn't want to wait any longer to get his son back. He's had enough. If he doesn't have his son back soon, he's going to destroy the Enterprise... or at least try. They really don't have very advanced weaponry compared with the Federation flagship. "I will throw my pet rock at you!" That's when Picard walks onto the bridge and tells Endar what Jono has done. But he says that the only crime that has been committed on this ship is that Picard has tried to sway a child against his father. Picard agrees to do the right thing and give Jono back to Endar. I forgot to mention earlier that Endar really does seem to be a loving and caring father to Jono, despite his violent background. Picard then takes Jono to the transporter and, for the first time, Jono takes off his gloves in order to touch an "alien," Picard, and thank him for all he's done. Maybe the Federation doesn't always know what's best, but they always figure it out by the end of the episode. That last paragraph was what I got most out of this episode. They spent the whole time trying to return Jono to his Human family and it took a stabbing to convince Picard that Endar was actually his family; the one by whom he was raised. This episode is a great message for adopted children, but it kind of leaves me wondering how Jono chose to grow up after this incident. He now knows he's not only adopted, but a completely different species from his father. How does that affect the rest of his life? Does he eventually go back and visit Gramma Rossa? Do all the Talarian kids make fun of him? I guess we'll never know because Picard learned his lesson and that's all that counts, right?